Rosy Outlook: Styling a Skirt for Winter + FF Link-Up! Styling a Skirt for Winter + FF Link-Up! Happy Wednesday! Hope y'all are having a great week so far. I love shorter weeks like this because they seriously fly by! Sorry I have been slacking on my Friday posts lately. I promise this week I'm going to get up a post on Friday! Definitely just trying to find balance with the new job, a lot going on in our personal life and the blog. This leather skirt is one of my new favorite items in my closet! I have been wanting one forever but I really wanted to find one that was a work-appropriate length. I'm sure some offices this skirt might be considered a little too short but I feel comfortable wearing it to my office! It's also just adorable for date night or a girl's night out. Definitely a new fall/winter staple for my closet! This is a lovely work outfit and your coat is such a beauty. I love the color! It's very pretty. I'm such a sucker for skirts/dresses with tights! It's so cute and a great way to keep warm during the chillier months. Love that coat too! This is too cute! Of course I am loving the color combo and that coat is amazing and would go with everything! Super chic with those tights! Love this look, love you! Loving this classic look! You look so polished and put together in this skirt outfit! 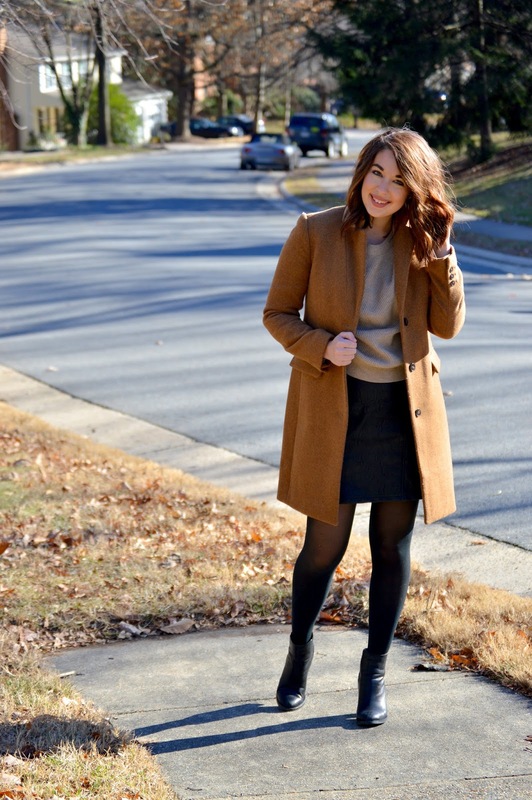 Love this black and camel look! So classic and so chic! what a cute look! Love the color combo. Great skirt! I love the slight A-line shape to it. I love the colors in this look. Leather skirts are great for winter. I absolutely adore that coat! It's such a beautiful camel color and look so good paired with the skirt. I definitely need to add a camel coat to my collection. Thanks for the inspo, beauty, and I hope you're having a great week so far! Oh I just love this outfit. It's really cute and chic and the colors are such a great neutral! Great look! What a fantastic color the coat is! Oh I love your coat, sooo stylish! That outfit is so cute!!! I love the skirt. Skirt, coat, and otk booties is such a classic combo, and you definitely pulled it off with this beautiful outfit dear! Your coat is really pretty!